This event is sold out! For more information or to ask about our event wait list, please email Nichole Regulski at Mnrags@hotmail.com. 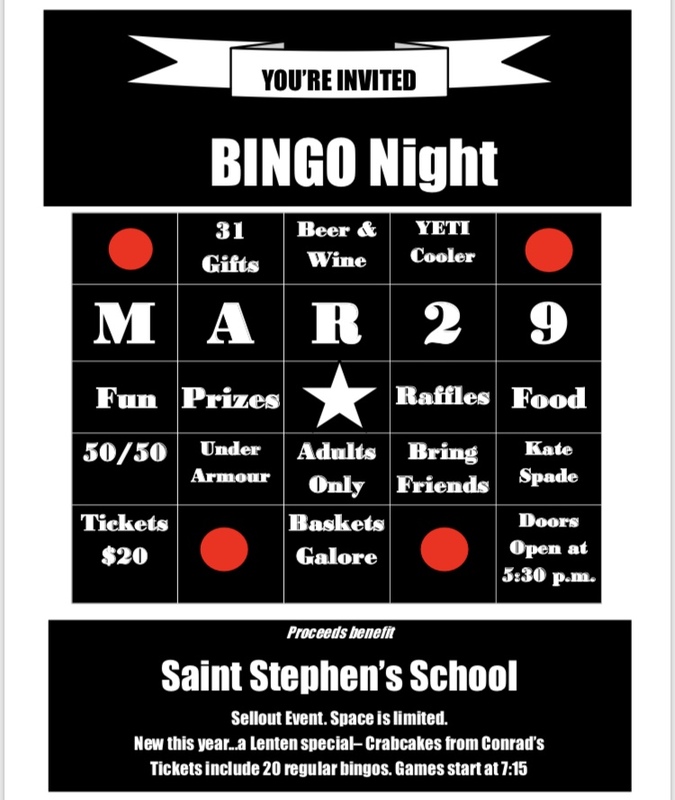 Join us on Friday, March 29, 2019 for a night of basket BINGO fun! Doors open at 5:30pm and games begin at 7:15pm. Tickets must be purchased in advance. This event is known to sell out. Sorry, you must be 18 or older to attend this basket BINGO. New this year: Ticketless Event! All tickets will be purchased online and your names will be available at the door for check-in. Tickets are $20 per person and include 20 games, access to specials, and access to raffles. Beer and wine will be available. Come hungry. Conrad's crab cakes will also be available for purchase as a Lenten Special. Family, class, or business sponsorship are available at $50 each.Contact Nichole Regulski for more information at Mnrags@hotmail.com or 410-812-1096.